We've seen loads of games based on comic books, many more styled to look like comics regardless of heritage, and even a couple set in comic-panel worlds—Sega Genesis favorite Comix Zone comes to mind. 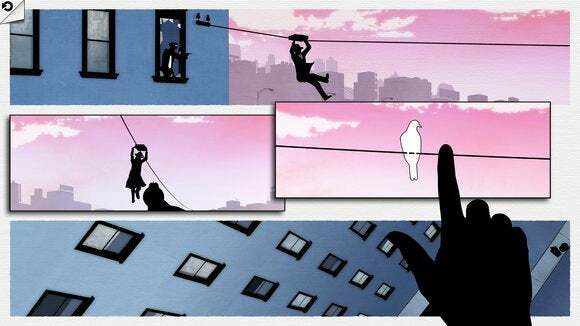 But Framed tries a different approach: it's a game designed to mimic the flow and structure of a comic book or graphic novel. It builds mechanics from the placement of the panels themselves, which is incredibly clever. This noir-soaked tale sees you alternately guiding a shadowy man and woman away from police and an unknown pursuer. You'll never directly control the characters; there's no directional pad or action button. You also won't tap the ground to make them move, or swipe when an icon appears to trigger a contextual action. All of the usual touch and controller-based interactions are nowhere to be found. All you'll do is reposition or manipulate the colorful panels that appear on the screen, in the hopes of creating a safe path from top to bottom. It's sort of mesmerizing to see it in action, because it's incredibly simple—so much so that there isn't a spoken or written word throughout, even in the tutorial moments—but also supremely effective as a puzzle mechanic. And while the trial-and-error approach never feels truly daunting, the challenge does steadily increase as new panel interactions and more complex sequences are introduced. 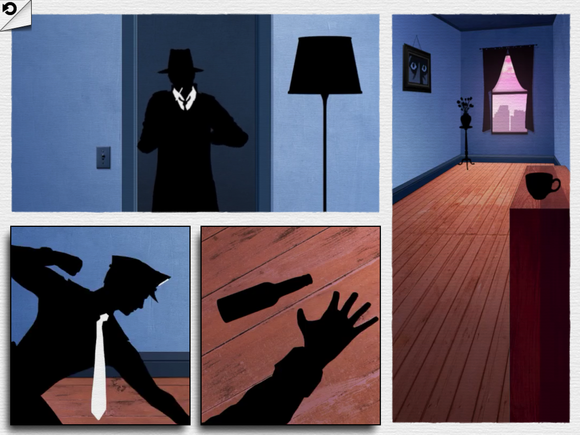 You'll rearrange comic panels to help the animated character evade capture. It starts out easily enough: there are just two panels to swap here. It's one of a kind: I've played games where the characters are in a comic-frame world, bashing through panels in a winking, fourth-wall-breaking kind of setting. Framed isn't like that. Everything exists within the panels, and the comic book design is merely how you go about ensuring the events that follow work out well (or as best as possible) for the sprinting character. It really plays like nothing I've ever seen before, and it's an absolutely perfect fit for touch devices. Despite feeling completely new and fresh, Framed's mechanics are incredibly obvious. It's impressive, really: all you need to do is see the first couple of pages, rearrange the easy early panels, and you'll understand how most of the rest of the game plays out. Because it's all about context clues and figuring out how the result of one panel plays into the next. Easy as pie, right? This one's tricky because there are so many panels—and they look so similar. But you need to pay attention to the ladders to build a clear path through. Don't worry, it gets harder: Indeed, Framed's mechanics are learned quickly, but the game adds a couple of twists that amp up the challenge before long. You'll encounter panels that can be rotated, which alters the direction of the path and can completely alter the route ahead. And in some scenes, used panels can then be moved again, and the game uses those in some instances to create looping sequences that require a bit of memorization. 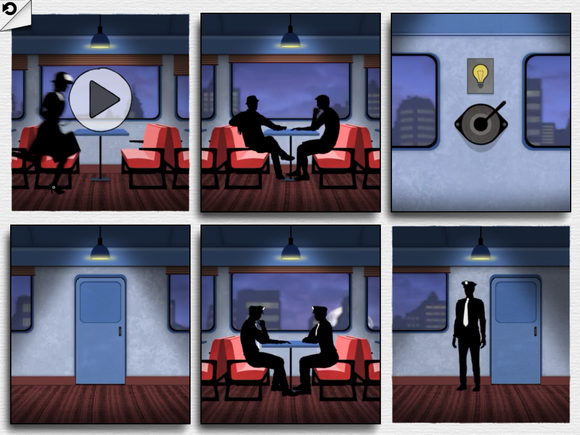 One scene even has police spotlights that shine onto other panels, making their correct placement even more essential. Some puzzles let you use certain panels multiple times. In this case, the luggage knocked down on the first pass becomes a makeshift stairway to the top level. But when should you place it back into the chain of events? 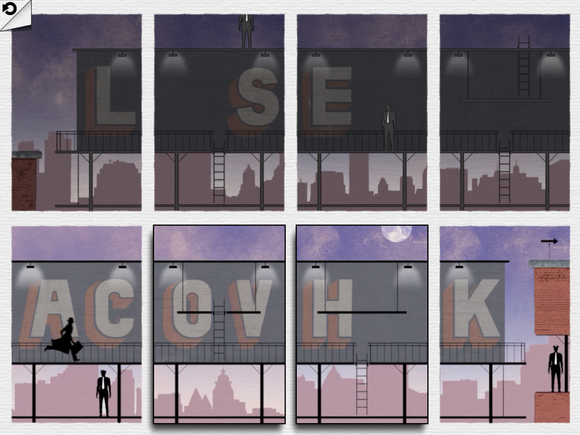 It's short, but super sweet: Assuming your mind isn't too boggled by any of the puzzles, Framed can be cleared in about two hours' time. Some might see the $5 price tag and see flashing red lights, but I think it's the perfect length. It's like a film, albeit one you lightly interact with. With such simple mechanics, anything longer might've risked repeating the same puzzle designs over and over—or worse, overcomplicating what feels like a pure expression of the comic-inspired design. Where you drop the power lever panel in this one is crucial, as it'll help you stay unseen while rushing through the train car. And Framed really is a premium experience deserving of your money. Beyond being a seriously smart concept, the noir art style is swell, the animation is dazzling, and the jazz score is just the cherry on top. 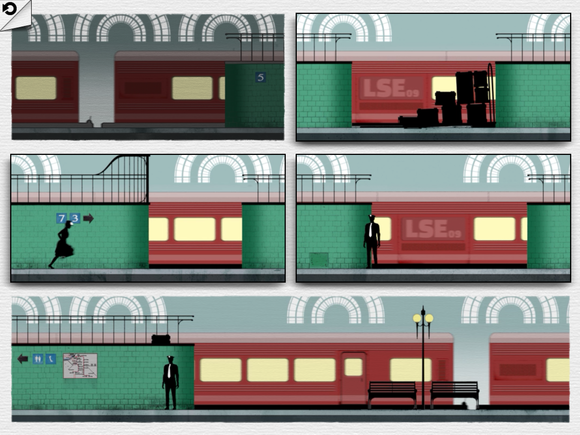 If you're tired of playing games that look or feel familiar, turn your attention to Framed.